Belfast faces the highest risk of terrorism of all European cities, while London is “low risk” despite being an “attractive target,” a new study claims. The research, published this week, examines cities across the globe most likely to suffer terror attacks. It was carried out by risk analytics firm Verisk Maplecroft, which compiles data for use by insurers and financial corporations. The focus of the report is guiding investment and protecting global economies from the risks of terrorism. “An estimated 80 percent of global GDP is generated from cities,” Verisk Maplecroft’s leading analyst, Charlotte Ingham, told the Independent. “Visibility of the sub-national differences in terrorism levels should be an imperative for multinational organizations looking to understand and price the risks to assets, employees and supply chains,” he said. London is ranked 400th, despite the current heightened terror alert. Verisk Maplecroft says this low ranking comes from the fact that Britain’s capital has not suffered a terror attack since the 7/7 bombing in 2005. Paris has soared in the rankings to 97th, however, due to the attack on the offices of French satirical magazine Charlie Hebdo in January. “The risk level in Paris is representative of a wider trend for Western countries, including Belgium, Canada and Australia, where key urban centers face substantially higher threat levels than elsewhere in the country,” Verisk Maplecroft said. A number of African cities are considered high risk, including Nairobi in Kenya and Lagos in Nigeria. 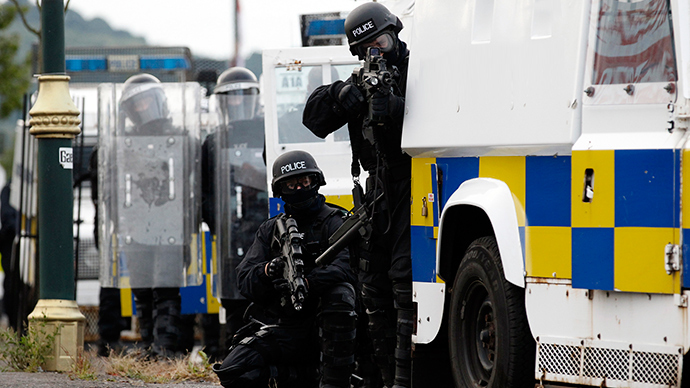 Belfast’s position as most-at-risk city in Europe may also reflect recent British defense policy. In March, it was announced that British Special Forces soldiers are once again operating in Northern Ireland to counter violent dissident groups including the Real IRA, intelligence sources say. Quoted in the Daily Star, they said up to 60 members of the Special Reconnaissance Regiment (SRR), a special unit of the British Army, are operating in the region. One source told the paper that heightened dissident activity and the increased terror threat were linked to the approaching 100-year anniversary of the 1916 Easter Rising – a period of Irish history that remains emotive. The SRR replaced an earlier unit known as 14 Intelligence Company. Its creation in 2005 saw the specialist close surveillance role developed during the Troubles expanded for the War on Terror. The same year it was reported the SRR had been involved in the counter-terrorist operation that eventually led to the death of Jean Charles De Menezes. De Menezes, a 27-year-old Brazilian worker, was gunned down by the Metropolitan police in 2005 in a south London tube station. Commenting on the new study, counter-terrorism and security expert Charlie Bird, who worked for the Diplomatic Service and alongside the military during the 2003 Iraq invasion, told RT that the risk in Northern Ireland is unique because of the factional nature of conflict between loyalist and dissident republican groups. These, he said, “normally attack either each other or security forces” rather than carrying out “indiscriminate attacks” against the public. He added that the findings “seem to run counter to the government narrative,” which currently focuses heavily on the threats posed by Islamist terrorism.